Mauve (H2) flowers, VII–IX; dark green foliage; bushy, vigorous; height 31–45cm; spread 46–60cm. Introduced by Manning's Heather Farm (Sebastopol, California, USA) before 1982 (when it was obtained by Alice Knight). Registered on 13 February 2005 by Johannes van Leuven, Ilmenweg 39, 47608 Geldern-Liillingen, Germany. White flowers, VIII–IX, in long spikes; mid-green foliage; height 31–45cm; spread 46–60cm. Best vigorous single white ling; ideal for cut-flowers. ♤ Bud-flowering (Knospenblüher); buds red (H6): IX-XI; foliage dark green; habit after 3 years to 10cm tall, 30cm across. Deliberately raised cross made and selected by Kurt Kramer: Knospenzwerg 9 (11-58-9). ®C.2016:01 Registered on 21st February 2016 by Kurt Kramer, Edewecht, Germany. Mauve (H2) flowers, IX–X; dark green foliage; low, upright habit; height 16–20cm; spread 31–45cm. 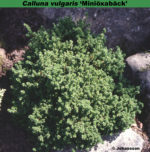 Similar to Calluna vulgaris 'Mullion' but more vigorous. Wild-collected; found in France about 1981; introduced by P. Bakhuyzen & Zonen (Boskoop, Netherlands) about 1981, but discontinued in 1984. It is named after a French friend of the introducer. Mauve (H2) flowers, VIII–IX; light yellow-bronze foliage in summer, darkening to orange, and then to bronze-red in winter; height 31–45cm; spread 46–60cm. Particularly attractive in spring. Originated in the Netherlands and named after the Canadian province. ❁ Flowers double, 6mm long, 6mm across, magenta (H14); VIII-X; foliage green; new growth green; habit upright; height 60cm; spread 30cm across after 3 years (pruned). Sport on ‘Annemarie’ found in August 2006 by H. J. Kuipers in his nursery. Flowers darker than ‘Annemarie’ and habit more erect. Plant Breeders' Rights granted to Albert Bardt u. Sonne, Kirchlinteln, Germany, 18 February 1991. Purple (H10) flowers, VIII–XI; dark green foliage; height 31–45cm; spread 31–45cm. Sport on 'Ginkel's Glorie' found by Johannes van der Schaaf (Geldern-Veert, Germany). Sport on 'Mullion'; found by Kurt Kramer (Edewecht-Süddorf, Germany); introduced by Kramer about 1973. Named after Kurt Kramer's mother's sister, once a worker at his nursery. ♤ Bud-flowerer, mauve (H2); VIII-XI; foliage dark green; habit erect; height 25cm, spread 40cm. Wild-collected; found on Ginkelse Heide near Arnhem, Netherlands, by Dr Ir T. Visser (Wageningen, Netherlands); introduced by W. Haalboom & Zonen (Driebergen, Netherlands) by 1972. White flowers, VIII–IX; yellow-green foliage in summer, turning yellow in winter; vigorous, upright; height 31–45cm; spread 61–75cm. Seedling; raised by H. M. J. Blum (Steenwijkerwold, Netherlands) in 1974; introduced by P. G. Zwijnenburg (Boskoop, Netherlands) in 1979. Named after Herman Blum's eldest daughter. ♤ White buds with purple (H10/H4) tips, IX–XI; dark green foliage; height 26–30cm; spread 46–60cm. Named after Dr Visser's wife, Marleen Visser-Kiestra. 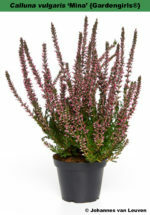 ♤ Deep pink (H8) buds, IX–X; mid-green foliage which does not darken much in winter; height 26–30cm; spread 46–60cm. ♤ Red buds, IX–XII; dark green foliage; broad, spreading habit; height 26–30cm; spread 46–60cm. Withstands early frosts better than 'Alexandra' and lasts a little longer but generally not quite as showy or as red. A sport on 'Marleen'; found first by H Tüber (Gescher, Südlohner Dam, Hamburg, Germany) in 1991, and later another, indistinguishable one was found by Kurt Kramer; introduced at Bundesgartenschau, Dortmund, Germany; submitted for plant breeders' rights in Germany on 14 September 1992; withdrawn 22 August 1995. Bulletin of The Heather Society 5 (10): 9-10 (1997). Preliminary designation was "Rote Marleen". Classified as C. vulgaris var. vulgaris f. diplocalyx. White flowers shaded lilac (H4), VII–IX; bright apple-green foliage; compact; height 16–20cm; spread 26–30cm. Introduced by Mayfair Nurseries (Nichols, New York, by 1969. Named after an employee of Mayfair Nurseries. Lilac-pink flowers, VIII–IX; green foliage, young shoots tipped orange-red in spring; broad upright habit; height 31–45cm; spread 31–45cm. Seedling found at Boskoop, Netherlands, by G. K. Langenberg, and named after the finder's daughter. More resistant to fungal attack than 'Spring Torch'. ♤ Bud-flowering; buds white, to 6mm long; VIII-XI; foliage light green; height 30cm; spread 35cm after 3 years (pruned). Deliberately raised cross by Kurt Kramer, made in 2007 between unnamed seedlings, selected in 2008. Has bigger buds than ‘Madonna’ and is more resistant against fungi. ® C.2013:06 registered on 8 December 2013 by K. Kramer, Edewecht-Süddorf, Germany. ♤ Bud-flowering; buds rose pink; VIII-XI; foliage light green; height 30cm; spread 35cm after 3 years (pruned). Deliberately raised cross by Kurt Kramer, Edewecht-Süddorf, Germany. No registration record for this cultivar. Mauve (H2) flowers, VII–IX; golden foliage turning red in winter; height 31–45cm; spread 31–45cm. Mauve flowers, VIII, very sparse; beautiful fine fern-like olive green foliage turning bronze with orange-bronze tips in winter; broad spreading habit; height 21–25cm; spread 31–45cm. Well worth growing for the foliage. Seedling collected from a gravel pit near Boras, south-western Sweden by the late Mats Johansson in 1985. Mauve (H2) flowers, VIII–XI; dark green foliage; broad, erect; height 21–25cm; spread 31–45cm. Crimson (H13) flowers, VIII–IX, very floriferous; dark green foliage; broad habit; height 46–60cm; spread 61–75cm. Similar to 'Carmen' from which it was a sport and to which it sometimes reverts; found by A. Vruggink (Epe, Netherlands) before 1980; introduced by P.G. Zwijnenburg (Boskoop, Netherlands) in 1981. ♤ Bud-bloomer, calyx white; IX-XI; foliage bright green; habit broad, bushy. Sport on 'Babette'; found by K. Kramer in 1998. "Finer than 'Melanie'". Registered on 3 November 2002 by Kurt Kramer. ♤ White buds in long spikes, VIII–XI; dark green foliage with prominent cilia; erect habit; height 31–45cm; spread 31–45cm.. Ideal for cut-flowers, this is an outstanding introduction. Seedling from 'Marleen' x 'Hammondii'; raised by Kurt Kramer (Edewecht-Süddorf, Germany) in 1984; submitted for plant breeders' rightson 7 September 1988; rights granted in Germany on 18 February 1991. Fantasy name; the nursery name 'Weißer Knospenblüher' . ❁ Mauve (H2) flowers, VII–X, double or semi-double, small but floriferous; dark green foliage; compact; height 31–45cm; spread 31–45cm. Raised by David Wilson (at Sardis, British Columbia, Canada) from 'Darkness' crossed with 'Tib'. Introduced in October 1990 (under the rejected name 'Mr J.') to Victoria Heather Society. Mick Jamieson was a sales representative for Wilson's Nursery and a friend of the raiser. home and planted him by the edge of the crazy path among our self-sown [Calluna]. He responded by throwing out some slender new growth.We think he is quite a character, and have potted him up and will bring him in for the winter. Will take cuttings next year.” This plant was propagated by John Hall in 2012. ® C.2012:05 registered on 30 October 2012 by Mike Ide, Fleet, Hampshire GU51 4HG. Pale mauve flowers, VIII–IX; dark green foliage; low, creeping habit, similar to, but a little taller than 'Mrs Ronald Gray'; height 10–15cm; spread 31–45cm. Found at Etten-Leur, Netherlands, by Mr van Steen and named after his wife's cat! White flowers, VII–IX; light green foliage, the young shoots are white and this colour persists a long time; compact, erect; height 40cm; spread 40cm. Sport on 'Poolster', found by Albert Bosch in 1998 at nursery. ® C.2006:07 registered on 29 October 2006 by Albert Bosch, Boomkwekerij Bosch, Westerlee, Netherlands. ♤ Bud-flowering (Knospenblüher), red; X-XII; foliage very dark black-green; green when young; habit upright, to 50cm tall × 50cm across after 4 years (pruned). Deliberately raised seedling, raised in October 2010, selected in October 2011. Named by Johannes van Leuven after his grandmother: “she loved flowers”. ® C.2016:03. Registered on 29th December 2016 by Johannes van Leuven (Geldern, Germany). Pink (H8) flowers, VIII–IX, sparse; bright green foliage; dwarf, erect forming a very attractive mat of green; height 10–15cm; spread 31–45cm. Wild-collected; a witch's broom found near Newry, County Down, Ireland, most probably by G. N. Smith (son of Thomas Smith); introduced by Daisy Hill Nursery (Newry, Co. Down) by 1930. Named from minimus = very little. Maxwell & Beale seem to have devised the name 'Minima (Smith's Variety)', with the last words enclosed in brackets. In this case, the name refers to Thomas Smith, Daisy Hill Nursery, Newry, County Down, Ireland. Mauve (H2) flowers, VIII–IX, sparse; mid-green foliage which turns brown-green in winter; mat-forming; height < 10cm; spread 10–15cm. Name comes from minimus = very little. 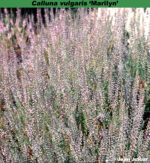 Mauve flowers, VIII, sparse; green foliage; forms a very dwarf cushion; height less than 10cm; spread 10–15cm. Seedling from 'Öxabäck'; raised by Hilding Nilsson (Sweden) in 1976; introduced by Arthur Persson (Tostarp, Sweden) in 1985. Name derived from Öxabäck, with mini- = little. The name is not hyphenated. ♤ Bud-bloomer, white; VIII-XI; foliage bright green; habit broad, upright. Sport on 'Fritz Kircher'; found by Kurt Kramer in 2001. Registered on 2 March 2003 by Kurt Kramer. Named by Kurt Kramer after Herr Kircher's mother. Pale lavender (H3) flowers, VIII–IX; mid-green foliage; nearly prostrate; height 10–15cm; spread 21–25cm. From St Kilda (K12). White flowers, IX–X; dark green foliage which is tipped bronze thus making a strong contrast with the flowers; height 31–45cm; spread 31–45cm. Sport on 'Long White' found in 1991 at Baumschule H. Hachmann (Barmstedt, Schleswig-Holstein, Germany). White flowers fading pink, VIII–IX; dark green foliage; upright; height 46–60cm; spread 46–60cm. Sport on 'Ralph Purnell'; found by H. Westdijk at Boskoop, Netherlands, in 1977; introduced by Westdijk in 1979. ♤ Bud-flowering: lilac (H4): IX-XII; foliage dark green; habit robust, upright; height 40cm; spread 30cm after 3 years. ® C.2010:02 registered on 14 June 2010 by Kurt Kramer, Edewecht, Germany. White flowers, VIII–IX, very sparse; mid-green foliage which has attractive cream tips in spring; height 10cm; spread 10–15cm. Flowers lavender-pink; VIII-IX; foliage gold-green in summer turning orange in winter; habit compact; height 15-20cm; spread 25cm. From Ken Hutchins, Mossyrock, Washington, USA. Pale lilac-pink (H11) flowers, VIII–X; dark green foliage; dwarf; height 10–15cm; spread 16–20cm. Seedling; found by D. Page at Lohbrunner Gardens, Vancouver Island, Canada, before 1962. Name is perhaps an allusion to its size. ❁ Red flowers, IX–XI, large; dark green foliage, tined grey in winter; open erect habit; height 46–60cm; spread 61–75cm. Flowers larger than, but not as dark as 'Red Star'. Sport on 'Elsie Purnell'; found in 1981; introduced by Werner Stier (Wiesmoor, Germany) by 1987; submitted for plant breeders' rights in Germany on 27 August 1987; withdrawn on 13 March 1991. 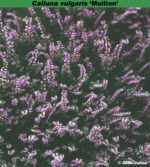 Pale purple flowers, VII–IX; dark green foliage, young shoots tipped with yellow, and tips red in winter; very broad, low, spreading habit; height 31–45cm; spread 46–60cm. A seedling from A. Bosch, Westerlee, The Netherlands, in 1992. White flowers, VIII–IX; mid-green foliage, new growth in spring is creamy white; height 26–30cm; spread 31–45cm. Mauve (H2) flowers, VIII–X; dark green foliage; neat, dwarf; height 10–15cm; spread 31–45cm. Collected near Mousehole, Cornwall, by Mr & Mrs John F. Letts and introduced by them. Lilac-pink (H11) flowers, VIII–XI, sparse; very dark green foliage, turning brown in winter, and young shoot-tips red in spring; height 16–20cm; spread 31–45cm. Wild-collected; found in Glenisla, Scotland, by Mrs A. W. Wilson (Dunfermline, Scotland) about 1935; introduced by Jack Drake (Inshriach Nursery, Aviemore, Inverness-shire, Scotland) by 1959. ❁ Heliotrope (H12) flowers, VII–IX; dark green foliage; loose spreading habit; height 30cm; sprerad 40cm.Very similar to 'Tib'. Sport on a wild plant; found by Albert Wilson (Royal Oak, Victoria, British Columbia, Canada) about 1959. 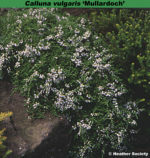 White flowers; VII-X; foliage bright green; habit erect; height 40cm; spread 65cm. Seedling; found by Sir George Taylor in Major & Mrs G. Neil Collins's garden at Inverchapel Lodge, Loch Eck, Scotland, in 1970. Named after Major C. N. Collins's wife. Pale lavender (H3) flowers, IX–XI; light green foliage, with pink shoot-tips most of the year; height 16–20cm; spread 31–45cm. Easily damaged by windburn. Collected on Broadstone Moors, Dorset, by Mrs P. S. Patrick. ♤ Crimson buds, IX–XI; dark green foliage; height 21–25cm; spread 31–45cm. Sport from 'Marleen' but more compact and with brighter buds. Found in the nursery of Venninx (Bratschaat, Belgium) and named after the wife of the finder. Mauve (H2) flowers, VIII–IX; dark green foliage; very prostrate twiggy habit; height less than 10cm; spread 31–45cm. Grows absolutely prostrate and can be walked on. Wild-collected; found in Devon, England, by Dr Ronald Gray (Hindhead, Surrey) in 1933, and introduced by Maxwell & Beale (Broadstone, Dorset) in 1936. Named after the finder's wife, Dr Violet Gray, who was a Vice-president of The Heather Society (1966-1983). White flowers, VIII–IX, in long narrow tapering spikes; mid-green foliage; height 10–15cm; spread 46–60cm. One of the St Kilda collection (K55), named after a hill on Hirta. White flowers, VIII–IX; bright green foliage with a characteristic curl to it; very dwarf and compact; height less than 10cm; spread 21–25cm. Wild-collected; found on Mullardoch, a hill between Plockton and Strone, West Ross, Scotland, by Dr Murray (Edinburgh, Scotland) in 1967; introduced by Jack Drake (Inshriach Nursery, Aviemore, Inverness-shire, Scotland) by 1967. Named after a hill in Wester Ross, Scotland. Lilac-pink (H11) flowers, VIII–IX; dark green foliage; low upright habit; height 16–20cm; spread 46–60cm. Wild-collected; found at Mullion, Cornwall, England, by Mr & Mrs D. F. Maxwell (Corfe Mullen, Dorset) while on their honeymoon in 1923, and introduced by Maxwell & Beale (Broadstone, Dorset) in 1928. Named after the place on the Lizard, Cornwall, where it was found. Mauve (H2) flowers, VIII–IX; foliage copper-coloured in summer with brilliant orange and red flecks for most of the year; height 10–15cm; spread 21–25cm. Liable to revert to plain green. Found in the USA before 1961; introduced to Britain by The Crown Estate, Windsor Great Park, Berkshire, England, about 1961. It was claimed that this cultivar was originally named 'Prairie Fire' in North America but when introduced commercially in England during the early 1960s the name 'Multicolor' was used. It is produced in very large numbers in the UK, and reverting to the original name would cause chaos. 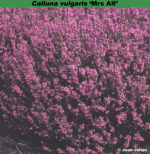 While multicolor exists as an epithet for a forma within Calluna vulgaris, that forma is very rarely encountered and the epithet is hardly ever used. Because we consider it desirable to maintain existing usage 'Multicolor' will be proposed for conservation. Note: 'Multicolor' ('Prairie Fire') is not in any way connected to f. multicolor of Beijerinck. White flowers, VII–IX, free flowering; bright green foliage; height 26–30cm; spread 46–60cm. Needs to be kept well pruned. Named after the wife of the finder. ❁ White flowers, VIII–X; dark green foliage; height 31–45cm; spread 46–60cm. Very showy but has a tendency to revert to 'H. E. Beale' (pink flowers) from which it was a sport. Sport on 'H. E. Beale'; found on 15 September 1974 during a visit by the Midland Group of The Heather Society, by Graham Cookes, in his garden, Little Froome (Drayton Lane, Fenny Drayton, Warwickshire, England).